Introduction to the basic elements of acting, body perception and body talk. 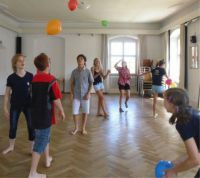 Exercises develop a sensory perception of the self, stage and social presence. "Body and Space" encourages the confidence to heed and follow impulses. Learn to fill the stage.